Me: So, how did your classes go, today? DD#2: Well, my first class was "Intro to Ecology." Me: So, how was that? DD#2: Well, it was interesting actually. I'd forgotten how weird some people are and how they will raise their hands and say the strangest things in class. DD#2: Well, the Ecology professor asked us "what we considered to be the greatest ecological factors that will impact our world in the years ahead." Me: And a student said? DD#2: Extra Terrestrial Beings, Aliens, Beings from other Planets. How can you tell if you've been abducted by aliens? An unusual preponderance of checkmarks indicates the distinct possibility that you have, indeed, been abducted by aliens. And if not officially abducted, than perhaps just had an alien encounter...in or out of a college classroom. 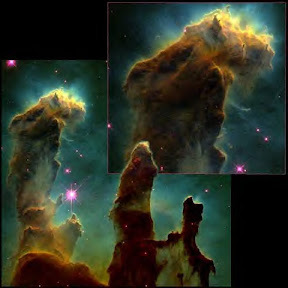 The Pillars of Creation within the Eagle Nebula: a young open cluster of stars in the constellation Serpens, discovered by Jean-Philippe de Cheseaux in 1745-46. This region of active current star formation is about 7,000 light-years distant. The brightest star in the nebula has an apparent magnitude of 8.24, easily visible with good binoculars ;) This view provided by the Hubble Telescope. Um, ok -- way too many of those things I have check marks by -- but, abduction by ailiens?? Not so sure I'm gonna buy that one!